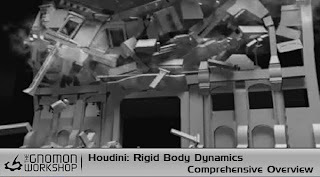 Houdini’s dynamics system (DOPs) is a very powerful tool that allows users to not only simulate physics, but to interact with the simulation in order to make an impossible looking effects shot look realistic. This is what has made DOPs the dynamics software of choice for high-end feature effects in a very short time. This DVD covers the rigid body dynamics (RBD) features of Houdini, as well as the controls and forces that are common to RBD, cloth and hair systems (though cloth and hair are not covered in this DVD). Houdini’s rigid body dynamics have been used to make characters run through walls (X-Men 3), crumble to pieces (Gatorade commercial), and to make objects on a cruise ship fly around as the ship capsizes (Poseidon). This disc is a comprehensive reference, covering features in great detail through many simplified examples, as well as completed case studies of a bowling ball, dominoes, an exploding building and a crashing train.